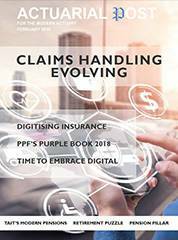 Our cover story examines the changing landscape of claims management from the BDMA perspective. We also have Stephen Wilcox, CRO from the Pension Protection Fund, exploring the DB Pension Scheme Universe. We also have a feature from the CEO of Azur on the insurance industry and its digitization. Our regular columnists are also back into the fray with, among others, Zoe Bolton interviewing Cherry Chan from Barnett Waddingham and Kareline Daguer looks at insurers and Cyber Risk. Topically, Dale Critchley’s article Pensions V Brexit considers one aspect of this long running saga.